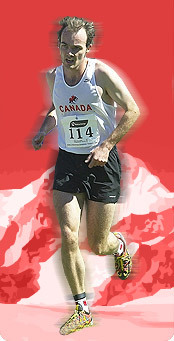 The Canadian men, led by Ontario's Taylor Murphy, were victorious at the 7th North American Central American and Caribbean (NACAC) Mountain Running Championships on July 9th, 2010. The Canadian team also included Edmonton's Adrian Lambert, Victoria's Kristopher Swanson (pictured) and Squamish's Jason Loutitt. Although the American men held an early lead the Canadian men managed to finish ahead of the Americans to claim victory. The final ascent, the steepest and most demanding terrain on the course, proved decisive for the team finish, with Lambert passing Brandon Lord (USA) in the final 100m to ensure a Canadian victory over the Americans. In the individual competition, the USA's Joseph Gray (pictured) established an early lead on the first ascent and never looked back, finishing nearly 30 seconds ahead of his closest competitors. The women's competition was also won by an American, with USA's Brandy Erholtz taking the top honours. Canadians Murphy and Ivan Babikov rounded out the podium on the men's side. American Megan Lund and Canadian Maria Zambrano were the second and third women, respectively. The American women put in a commanding performance to win the NACAC women's race. The USA team proved too strong for the Canadians, with three of the top four positions being filled by the American women. The event was held at the Canmore Nordic Centre in Canmore, Alberta, after grizzly bear activity on the Nakiska Ski Resort forced the organizers to make a last-minute course change. The final course was approximately 7.5 km long, with 600m of ascent and 130m of descent. Canadian men and American women win NACAC titles. Joseph Gray (USA) and Brandy Erholtz (USA) crowned NACAC Champions. A summary of the race written by Mihira Lakshman can be found here. Athletes from the United States of America and Canada will go head-to-head at the NACAC Championships in the Canadian Rocky Mountains. Athletes to watch from the United States include Joe Gray who was 16th at both the 2008 and 2009 World Mountain Running Championships (WMRC), Christine Lundy, (13th, 2009 WMRC), and Brandon Lord, (4th Junior, 2009 WMRC). On the Canadian side, athletes to watch include Kris Swanson (3rd, 2009 Commonwealth Uphill Championships), Amy Golumbia (2009 Canadian Champion), Adrian Lambert (2007, 2008 Canadian Champion) and Jason Loutitt who was 31st at the 2005 World Mountain Running Trophy. Athletes will contest a challenging all-uphill course on the mountain at Nakiska Ski Resort, the site of alpine skiing events at the 1988 Calgary Olympics. The race is virtually all at a 10% grade on mixed grass and compacted dirt double-track trails. The race finishes just below the summit at elevation 2280m. The first male and female finishers to the top will be crowned NACAC Champions. The race will also serve as the Canadian Mountain Running Championships and is the qualifier for the Canadian Mountain Running team at the 2010 World Mountain Running Championships in Kamnik, Slovenia on 5th September 2010.